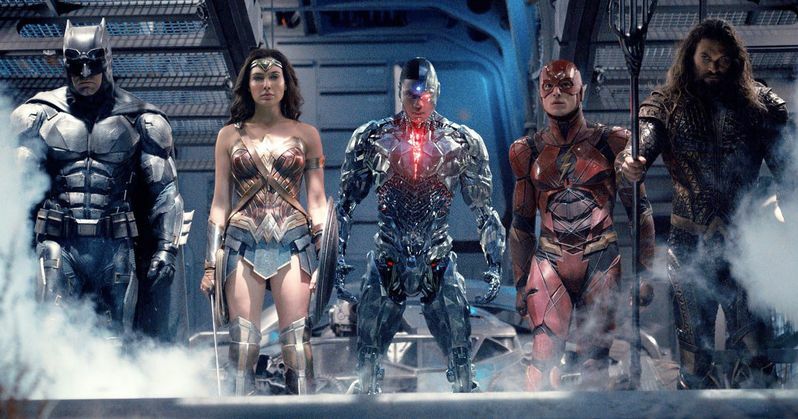 Warner Bros. has released a new photo from the highly-anticipated Justice League movie, which assembles some of DC Comics' biggest heroes. The photo features Batman (Ben Affleck), Wonder Woman (Gal Gadot), Cyborg (Ray Fisher), The Flash (Ezra Miller) and Aquaman (Jason Momoa), but Superman (Henry Cavill) is still nowhere to be found. While the beloved hero is expected to be resurrected at some point in the movie, after sacrificing his life at the end of Batman v Superman: Dawn of Justice, we don't know exactly how this will happen quite yet. Of course, Superman's sacrifice is one of the reasons this Justice League is formed in the first place, with Batman assembling this team of heroes. USA Today debuted this new photo and spoke with director Zack Snyder, who shed some light on Wonder Woman's arc in both her stand alone movie, debuting this June, and how it leads into the Justice League story. Here's what he had to say below. "It was all about the filling-out of this massive comic-book pantheon with the biggest and coolest heroes we could. (Wonder Woman learns that) humanity isn't always the most kind and awesome thing. It has its moments, but it can be brutal, and her coming to terms with that dichotomy is what we come to learn about her. And in Justice League, she's fully evolved into someone who's embraced mankind, partly through Superman's sacrifice. She's like, 'All right, I've got to pick it up.'" Last month, the full Justice League cast was announced, which includes Ben Affleck} as Batman, Henry Cavill as Superman, Gal Gadot as Wonder Woman, Jason Momoa as Aquaman, Ezra Miller as The Flash, Ray Fisher as Cyborg, Amy Adams as Lois Lane, Willem Dafoe as Nuidis Vulko, Jesse Eisenberg as Lex Luthor, Jeremy Irons as Alfred Pennyworth, Diane Lane as Martha Kent, Connie Nielsen as Queen Hippolyta, and J.K. Simmons as Commissioner Gordon. While most of these had been previously confirmed, it was the first we officially heard about Lex Luthor returning, although there had been rumors about his return in the past. Zack Snyder is directing Justice League from a script by Chris Terrio, who won an Oscar for writing Ben Affleck's Argo and Batman v Superman: Dawn of Justice. Warner Bros. has set a November 17, 2017 release date for Justice League, with Justice League Part Two hitting theaters on June 14, 2019. Justice League currently has its November 17 release date to itself, opening just two weeks after Marvel's superhero sequel Thor: Ragnarok. Take a look at this new Justice League photo below.